JAK Industrial Painters Tape is multi-use. It's specially frmulated, medium tack adhesive works well on textured and semi-rough surfaces which gives the tape the tackiness it needs to adhere to your surface but still allows for clean removal. If not overheated, your surface will be damage free and clear of residue. UV resistant for both indoor and outdoor use. Please note: tape is NOT moisture resistant and works best when surfaces are clean and dry. It is advised to remove the tape ASAP as leaving it on for weeks could cause damage to the surface. 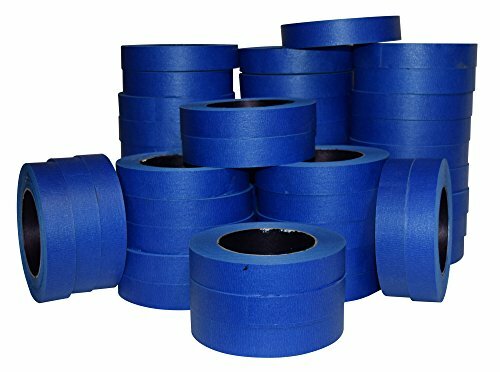 Case of 48 rolls of painters tape bulk packed for easy use and access. Each roll is .94 inches by 60 yards of masking tape. Professional grade tape is flexible, leaves no sticky residue behind, prevents paint bleed, removes without damaging surface, and gives clean edges. Use for every kind of painting, trimming edging, masking. or protecting. Brightly colored tape works well with delicate and bold paint colors. Durable, strong tape sticks to a variety of clean / dry surfaces. Apply pressure when adhering tape for the cleanest lines as adhesive is pressure sensitive and heat activated. Ideal for use in temperatures from 40 to 130 degrees Fahrenheit. Made in the USA. If you have any questions about this product by JAK Industrial, contact us by completing and submitting the form below. If you are looking for a specif part number, please include it with your message.